Gun storage is a critical component of gun or rifle ownership and must be considered prior to investing in a piece of one’s own. Storage serves multiple purposes – safety, maintenance, accessibility and display. Determining which of these aspects is most important to you as a gun owner is the first step to identifying which type of storage is optimal for you. For example, gun owners with small children will want to focus on safe gun storage, while those who hunt frequently want to make sure they can access their guns easily. Still, those who collect antique rifles and gun parts may want to purchase a display case to show off their prized collectibles. The right to own guns comes with the responsibility of safe and effective gun storage. It is important to consider who will have access to these guns and rifles, how long they will be stored for, and what their ultimate purpose is. Remember that guns that will remain stored for long periods of time are at risk for damage due to humidity and dampness so consider temperature-controlled features when looking into storage options. Gun safes are available in a variety of sizes from small to cabinet-sized, allowing for storage of multiple guns. These safes are often temperature and humidity controlled ensuring that all your items will be safely stored and maintained whilst in storage and that no damage will be endured. Additionally, safes provide the most secure way to store a gun – difficult to break into, heavy to move (they can also be anchored to the ground) and impossible to penetrate without the access code, a gun safe provides the most secure guarantee that nobody but you will have access to your items! 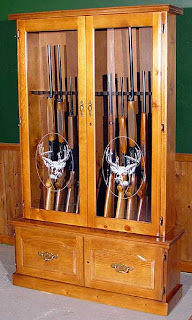 Gun cases and cabinets are a perfect way to display you gun or rifle collection in the home. Often made of wood with glass panels, these cabinets can usually hold multiple pieces and are a great way to showcase vintage and antique rifles. Although most of these cabinets have locking mechanisms, glass can easily be broken so keep this in mind when considering safety. For those worried about the safety aspects, storing ammunition elsewhere and keeping guns unloaded will minimize these problems. A gun rack works for those without children and who have lower safety concerns for their household (for example, those who live alone or are in safe neighborhoods). These racks are also great for hunters who have a separate hunting lodge or residence as they allow the guns to be beautifully displayed and easily accessed when needed. The downside to the racks is that they provide no safety precautions whatsoever – no enclosures and no locking mechanism means anyone can have access at anytime. Be sure to store ammunition separately and, if possible, remove the gun barrel or rifle magazine from the piece. Possibly the safest way to store a gun at home outside of a gun safe is to take it apart as this method prevents anyone who does not know how to assemble the gun from using it. When the gun or rifle is disassembled the separate gun parts and accessories can be stored in different locations. For example, store any ammunition in a separate location from the gun magazine and other pieces. Separating the pieces of the rifle and storing them in different areas lessens the likelihood of accidents occurring, however, this also lessens the efficacy of the gun in the event of a home invasion. No matter which storage method you select, the most important and effective way to ensure safety and avoid accident is to educate yourself and your family about gun ownership and responsibility. Check back to find out more about gun ownership and maintenance and find gun parts, replacement pieces and accessories at Del-Ton, Inc.
Tony Autry is the owner of Del-Ton, Inc., and online purveyor of gun and rifle models, parts and supplies. Browse our wide array of rifle kits, barrel assemblies and more and contact us with any questions!